Altamonte Springs, FL — UMA Solar is proud to announce their first solar flat plate collector for solar water heating made in the USA – the Aurora Solar Collector by Solene. The collector will be on display at the annual Solar Power International 2009 in Anaheim, CA on October 27 – 29. "We asked our dealers, if you could have the perfect solar collector, what you would like to see," says Robert Zrallack, Vice President of Sales at UMA Solar. "They gave us a laundry list of items they deemed important. We listened and the Aurora collector was born. They wanted high efficiency and a high BTU output to satisfy performance based incentives." Aurora Solar Collectors are the most technologically advanced collectors on the market, with the industry’s best warranty. In the end, Aurora offers the highest quality materials & state-of-the-art engineering to provide maximum efficiency & durability homeowners can depend on for years to come. Like many UMA Solar products, Aurora by Solene uses state of the art mounting hardware that surpasses the quality and durability of its competitors. "We gave them the highest BTU rating available today," says Zrallack. "They wanted a collector that could withstand high velocity winds or a couple feet of snow sitting on top of it. We built a battleship. Extruded aluminum box, reinforced corners, sidewalls braced together to eliminate bowing, easy removal of glass or absorber for servicing if needed, OG100 approval and private labeling for quantity buyers." Doug Hagg, Regional Sales Manager agrees. "With top shelf BTU ratings and quality construction, the Aurora collector is sure to become a big player in the solar thermal industry," says Hagg. With the Aurora collector in such high demand, UMA Solar is in the planning stages of building a state-of-the-art manufacturing facility to begin in late 2010. They anticipate creating 50 to 70 new jobs in the Central Florida area. Victor Eyal, CEO of UMA Solar says, "Building the absolute best solar collector on the market, while having such a positive impact on the environment, economy, and job growth, is an incredible win-win situation for everyone involved." For more information about the Aurora collector please visit http://solene-usa.com/aurora.php, call 1-800-79-SOLAR, or visit booth 1110 at Solar Power International 2009 in Anaheim, California. 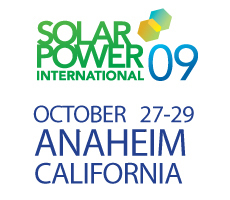 UMA Solar is proud to announce it will be an exhibitor at Solar Power International 2009, October 27- 29 in Anaheim, CA. We will be featuring our new Aurora flate plate collector, and the new revolutionary Simple Drainback solar hot water tank. We are bringing our A-Team: (Bob, Greg, Loren, Doug, Tod, Jimmy, and Torry) so if you’re going to be there, stop by Booth 1110 and say "Hi!" UMA Solar, distributor of the industry’s highest-performing solar technology nationwide, is partnering with Lyon Financial to offer a financing program that makes solar energy systems more accessible to consumers. With this new program, UMA Solar dealers nationwide will be able to offer a simple and effective way to be both environmentally responsible and economically affordable. The program offers an unsecured, same-as-cash loan of up to $45,000 for solar systems installed by any of UMA Solar’s authorized dealers nationwide. With no principal payments or interest for up to 18 months, this financing provides homeowners with sufficient time to realize the benefits of the existing 30 percent federal tax credit for the installation of residential solar energy systems, as well as the many state and local tax credits that may be available to certain homeowners. Customers of authorized UMA Solar dealers who qualify and participate in the same-as-cash solar financing program will have up to 18 months without payments or interest accruing. At the end of the period, the homeowner can either pay off the loan in full or convert it to a fixed interest installment loan. Individuals should consult with their own professional tax advisors concerning the available tax credits and their specific tax circumstances. The financing program is administered by Lyon Financial Services, a leader in home improvement loans and funded by EnerBank USA. Electricians, plumbers, contractors and other dealers of solar products interested in learning about the new financing program should call (800) 262-1655, or visit http://www.sameascashloans.com. UMA Solar distributes the industry’s highest-performing technology for residential and commercial solar applications nationwide. UMA Solar features industry leaders such as MyGen by Kyocera photovoltaic (PV) solar electric equipment packages designed specifically for residential grid tied application; Solene Solar Water Heaters which reduce utility bills by 25-30%; and Heliocol, the world’s largest solar pool heating manufacturer. UMA Solar offers its products through its network of over 700 dealers nationwide. In addition, five distribution locations are strategically placed throughout the U.S. for convenient and continuous availability. For more information, call UMA Solar at 1-800-79-SOLAR or visit http://www.umasolar.com.